Readers of this blog will know that I've posted frequently over the years about the continued dominance of Naver in Korea while Google became the dominant Internet search engine in all but a small handful of countries. (see these posts, for example) To understand this dominance, one must first understand that, strictly speaking, Naver is a web portal and not a search engine. 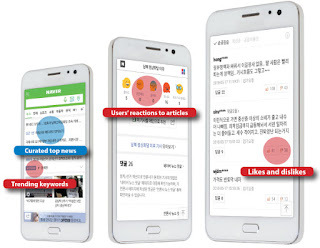 This overwhelming preference among Koreans for Naver is also understandable because its content is almost entirely in the Korean language and is presented in a manner that fits well with Korean cultural preferences. However, the almost-exclusive use of Naver by some also illustrates the Korean proverb "frog in a well." The Korea Joongang Daily has published an informative article entitled "Debriefing: Korea's problem with portals." I recommend it.